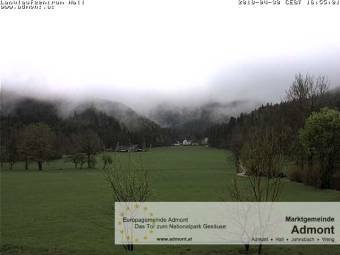 Webcam Hall bei Admont: Two Webcams - Two webcams viewing the 'haller Mauern' in the Enntal Alps, the Plesch and the 'Grosse Pyhrgas'. Spital am Pyhrn: A09, bei Rasplatz Pyhrn Priel, Blickrichtung Wien - Km 55,18, 7.2 mi. Liezen: Panorama View, 10.1 mi. Weißenbach bei Liezen: Webcam of the Golf- and Landclub Ennstal, 12.4 mi. This webcam Hall bei Admont with the theme Mountains was added on October 18, 2005 and is operated by Verein Antennengemeinschaft Hall. It got 16745 visitors since then. Shouldn't this webcam work or should the link be wrong please report that here. You can add this webcam here to myCams.